CHINESE: Xiao ye hei mian shen, Shan qi jing. JAPANESE: Hime kobannoki, Takasago kobannoki. MALAY: Hujan panas, Semomah, Seruyan. MALAYALAM: Kattuniruri, Pavalapula, Pavilapoola, Chuvannaniruri. TELUGU: Pogada, Yellari, Yerra-balli, Yerra purugudu. 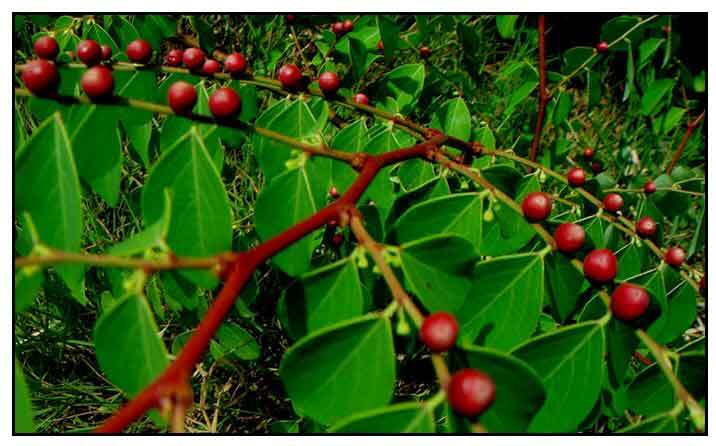 Matang-hipon is an erect, monoecious, slender, smooth shrub, 1.5 to 4 meters high. Bark is yellowish grey. Leaves are distichous, elliptic to elliptic-ovate, 1 to 3 centimeters long. Flowers are very small, greenish or pink, axillary, and about 3 to 5 millimeters in diameter. Fruit is pink, purple or dull red, somewhat fleshy, nearly spherical, about 5 millimeters in diameter. - Throughout the Philippines In thickets at low and medium altitudes, ascending to 1,500 meters. - Also occurs in India and Sri Lanka to China and Malaya. - Phytochemical screening of leaf extracts yielded alkaloids, flavonoids, glycosides, and saponins. - Study yielded a new megastigmane glucoside, canangaionoside. - Studies have shown antioxidant, radical scavenging, anti-cancer, larvicidal, adaptogenic, antihyperglycemic, hypolipidemic, hepatoprotective, tyrosinase inhibiting properties. - In the Philippines, bark is astringent and used to prevent hemorrhages. - In Behar, dried leaves are smoked, like tobacco, for tonsillitis. - In Chinese traditional medicine, used for treatment of chronic bronchitis and wounds. - In Ayurveda, used for leucorrhea, edema, menorrhagia, diabetes, dental caries. - Leaf juice given to mothers after childbirth. Terpenic and phenolic glycosides from leaves of Breynia officinalis HEMSL / Morikawa H, Kasai R, Otsuka H, Hirata E, Shinzato T, Aramoto M, Takeda Y. / Chem Pharm Bull (Tokyo). 2004 Sep;52(9):1086-90. Two new glycosides from Breynia vitis-idaea. / Meng DH, Wu J, Wang LY, Zhao WM. / J Asian Nat Prod Res., 2010 Jun; 12(6): pp 535-541 / doi: 10.1080/10286021003745452.